Join us for a frightfully fun Family Night! Halloween Party! The fun begins at 5:00pm with pumpkin carving, followed by games, haunted house (maybe even a boat) and costume parade! Come and even get your family costume photo taken! Buffet Dinner available. Email manager@kingstonyachtclub.ca to register! Next week we are planning to announce several things! Firstly, our new fall/winter menu! Secondly we will introduce all of our fall and winter dining events and special days planned for the membership. Included in this will be our “GO JAYS GO” themed nights and Specials! Just a reminder that the Gas Dock will now be closed on Saturdays. As we are getting into the cooler weather, and potentially windier days, we just want to remindmembers to ensure your boat (and neighbours boat) are secure. We generally take a daily trip around the harbour, however it would be fantastic to ask for your assistance. 1545h, every Wednesday, classes formally start at 1600h. The Cruising Fleet Annual General Meeting is scheduled for November 12, 2015 upstairs at the KYC at 7:00 p.m.
Munchies in the form of appetizers and finger foods will be available and the upstairs bar will be open. I’ll distribute the agenda closer to the meeting date. If you have anything that you would like to include in the agenda, please let me know by the end of October. I hope that everyone had a wonderful sailing season and comes to the AGM with ideas for next year. There were 10 boats out on a beautiful sunny day in a 15 kt breeze. The race was very close with the difference between 2nd and 3rd place a matter of inches! Protests info is now being posted (and updated) on the bulletin board. Our temporary marks are being hauled out early next week. We could use some volunteers to help on the water and shore with this job. A whaler has been outfitted by Brad with a powered winch to make this job easier. Email John Vines at jvines@bell.net if you would like to help. 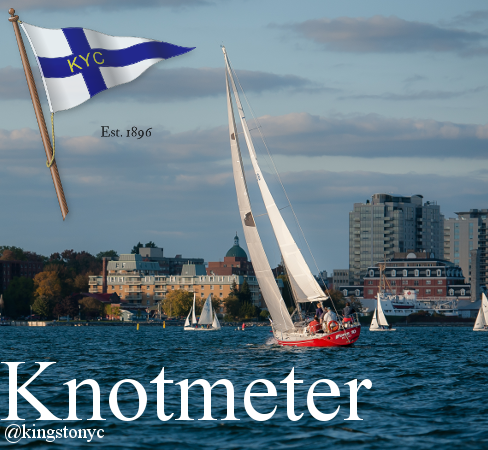 Nomination forms (including criteria) are available online on the "Sailing / Racing / Keelboat Racing" KYC web site page and at the bar. Please complete and return forms to the Race Office or email to race@kingstonyachtclub.ca by Wednesday October 14. If you have photos you'd like to share with others in the slide show, please send them to ken.martin@kingstonyachtclub.ca.